The life and times of Silvio Berlusconi, one of the most controversial European leaders in contemporary history. 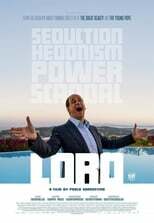 Loro is directed by Paolo Sorrentino and was released on Apr 24th, 2018. Director Paolo Sorrentino's Drama movie Loro is produced by Universal Pictures & Indigo Film & was released 2018-04-24.